91 is a locally built M Class tram. It entered service on the 15th of June 1909 and is one of a series which were the most common of all trams in the Auckland fleet. In total 99 M Class cars were built for use in Auckland, making them the most constructed tramcar design in New Zealand history. 91 has a rich history and is a bit of a phoenix. It is well known that it rose from the ashes of a serious runaway accident in Symonds Street in August 1926. 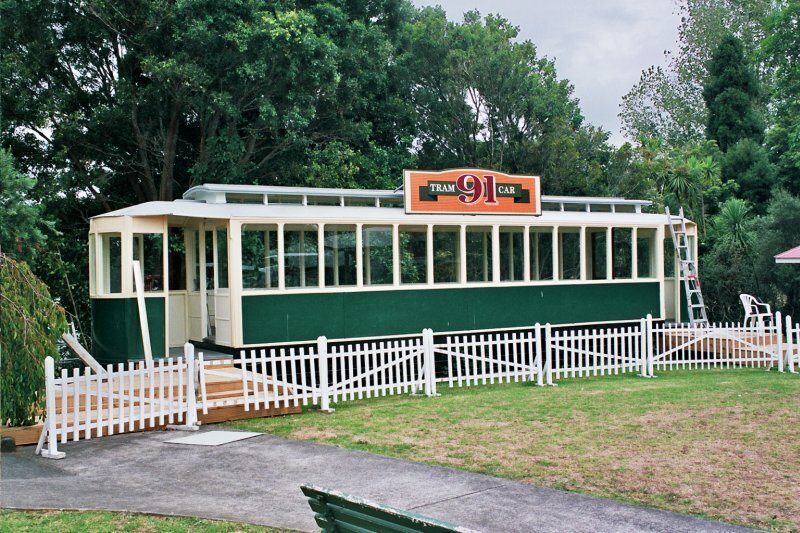 On the 20th of June 1955, Car 91 was the 128th tram body to leave the Manukau Road workshops in Epsom. It was purchased initially by Ted Russek and transported via truck to a paddock in Kopu to await resale as an implement shed, workshop, sleepout, or as a batch. After over more than 40 years serving as a workshop, in March 2000 it was destined to be bull dozed into a pit in Horahora, (already containing the previously attached lean-to shed), the pit of course ready and waiting next to the tram. In April 2000, it was transported to MOTAT, later to be repurposed as a dining car next to Cropper House. In 2017 91 was identified as surplus to requirements by MOTAT, and its future was again uncertain. In November 2017, rather than see 91 destroyed, the AETT stepped in and acquired the tram to ensure its preservation.